Jesus was the Word, and was there in the beginning. He came to earth, and lived among us. Thank Jesus that while he is God, He became a man, and came to earth as a little baby to live here to show us what God is like. Thank Him for coming to Bethlehem to be born. I took a picture of our felt figure of the Bible to stand for the Word. 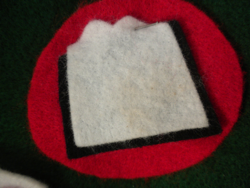 Your children could draw one, or you can get different colors of felt this week if you want to make each night. You can tell from the picture that they are very simple, all you need is craft glue and felt. Put them on your tree! Try to be flexible, since your schedule may require some creativity! When is your best time when everyone is most likely to be there? Right before supper? Breakfast? Just before bed? Decide ahead day by day the best time for that day—and be flexible! Just watch what can happen when you make it easy for your husband to read the passage! Let little children color, or play quietly on floor with quiet toys. If someone is missing, or needs to be removed from the room for ruining it for the others—just remove them without a lot of fuss. You don’t want the others to miss out on this special time. Remember that God is greater than our families’ imperfections. Timothy in the Bible was spiritually watered by His grandmother and mother—there is no mention of his father in regard to Timothy’s faith. Paul describes him as, “I have no one else like him.” Timothy was the result of less than ideal, or an imperfect family’s family devotions! Enjoy His Word with those who can be there, while praying for a way for all your loved ones to be there in time. It will increase the anticipation of what Christ did for us and who He is—leading up to Christmas Day!